Not quite ready for an entire kitchen remodel but still craving a big change that gives your kitchen a new and improved look? Try painting your kitchen cabinets for a fun change on a tight budget. With some primer, paint, and a few non-expensive tools you can add a splash of color to bland kitchen cabinets, or give older wood cabinets a more modern feel. Some people get brave, opting for bright cabinet colors—like all yellow cabinets for a kitchen that makes you feel cheery 24/7. The sky is the limit, the options as vast as your imagination. With proper preparation you can make your kitchen cabinets look like new and add years to their shelf life. The best part, the task can be completed in only one weekend! Most people want eye-catching cabinets with high-shine and a stylish, finished appeal. While new high quality cabinets come standard with all this, painting your kitchen cabinets requires careful prep work for a like-new finish. If the surface of your cabinet is not properly prepared it wont be able to absorb the paint—creating a look you might want to change more than your original cabinetry. The prep process in itself is the most difficult and time consuming but most certainty can’t be skipped. To start you will have to remove all cabinet doors, just don’t forget to keep track of where all of the cabinets belong, otherwise it might get complicated (more so than you think) when you go to put them all back. If you try to paint with cabinets still hinged onto the frame the results will be far from professional, plus if any hardware is accidentally painted doors can become jammed and problematic. Relocate your cabinets where you can prime and paint them, perhaps in your garage where you don’t risk making a mess out of your house. The primer you choose should be suitable for the type of material your cabinets are made from. Have this primer tinted to match your topcoat cabinet color; this is especially useful if you plan to paint dark cabinets a lighter color, helping to reduce the chance your old cabinet color will simply show through the new. When it comes to paint color, you also need to ensure the type of paint you select works well with your cabinetry. In general, there are 2 types of paint you can use for kitchen cabinets, acrylic enamel or alkyd paint. If you plan to use alkyd paints be sure to apply somewhere well ventilated, such as outside, otherwise this strong and toxic paint can cause damage to your lungs and insight illness. People still like to use alkyd paint because it provides rich texture and is resistant to a lot of surface wear. Acrylic cabinet paint is water-based, therefore it’s not toxic like alkyd paint, but it doesn’t always provide such a brilliant finish, nor is it guaranteed to last as long. Your kitchen cabinets are a big focal point in your kitchen, therefore every last detail matters when it comes to painting your cabinets a different color. -Don’t forget to paint the cabinet boxes! While you can remove your cabinets to reduce error, you’ll have to use extra precaution when painting cabinet box frames. Avoid painting your walls or backsplashes on accident by applying painter’s tape around all of the borders you plan to paint. -Clean your cabinets before you paint! Wipe cabinets down to remove all grim, dirt, and other particles so that paint goes on smooth. You can use a mixture of water and TSP (trisodium phosphate) on a sponge to deep clean surfaces, both on the outside and insides so that they are ready for paint. Beware, TSP is toxic so don’t forget your gloves and safety goggles! – To smooth away any nicks or damages on your cabinets, apply wood filler using a putty knife. Don’t forget to let the filler dry before going on to sand and paint your cabinets. 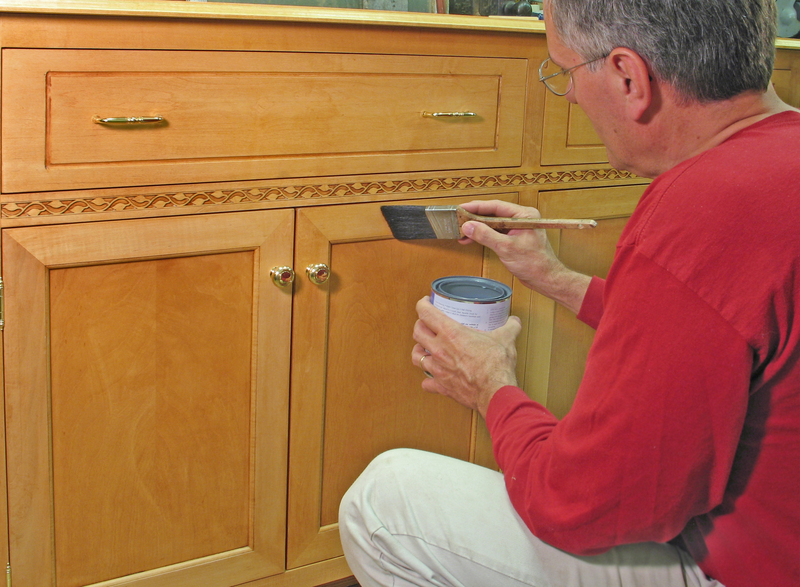 -Start slow, applying a few coats of paint to the back of one cabinet door. This way you know for sure if the color works well on your cabinets and dries smoothly before any uh-oh moments have a chance to occur.